Nanobots that reduce ocean pollution, solar cells that operate in the rain, and devices that transmit wireless data up to ten times faster. What binds these developing technologies together, aside from their innovative nature, is the use of a revolutionary material that has been a recurring topic of discussion on the COMSOL Blog. Its name? Graphene. Recognizing the advantages of this strong, lightweight material, more and more industries have begun to embrace graphene’s potential use for a variety of applications. Take biosensors, for instance. Because of its high electrical conductivity and large surface area, graphene is an optimal material selection for these devices. This can be attributed to the fact that a faster transfer of electrons prompts greater accuracy and selectivity in the detection of biomolecules. 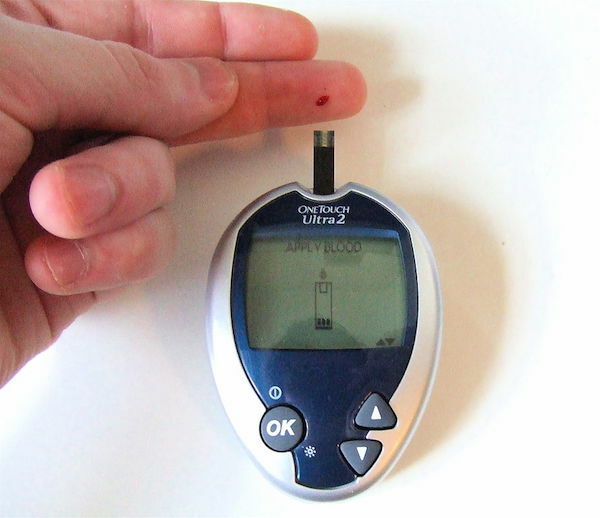 Glucose monitoring is one application of biosensors. Image by David-i98 (talk) (Uploads) — Own work. Licensed under CC BY-CA 3.0, via Wikimedia Commons. In an effort to help bring new sophistication and reliability to biosensors for therapeutic solutions and personalized medical applications, a team from the Polytechnic University of Bucharest designed and analyzed a 3D multilayered graphene biosensor with COMSOL Multiphysics. 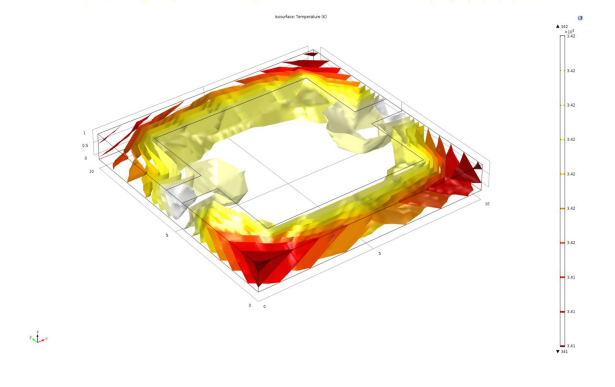 Let’s have a look at their research, which was presented at the COMSOL Conference 2015 Grenoble. As mentioned above, the research presented here is centered on a multilayered biosensor design. While single-layer graphene is known to be much more reactive than multilayered graphene structures, the edge of the material is more reactive than its surface. With graphene being rather inert, a multilayered graphene structure is an ideal option for biosensors. In addition to the design of the biosensor itself, it is also important to consider the interface with which it will interact. In this case, that interface is human skin. Because it is the part of the human body with the largest surface area and because its responses to external and internal stimuli vary, human skin is a good environment through which to collect physical and chemical data. This series of interfaces led to the development of two biosensor device models that could describe the influence of process variables as well as environmental stimuli. The first of these models is a single-layer graphene/graphene-oxide sensor device with two electrodes. The second model is a multilayered sensor device with four electrodes. For the latter case, the inclusion and exclusion of the graphene composite structure was studied to further differentiate between the graphene responses. A multilayered graphene biosensor device. Image by E. Lacatus, G.C. Alecu, and A. Tudor and taken from their paper “Models for Simulation Based Selection of 3D Multilayered Graphene Biosensors“. With their models in place, the researchers ran a series of simulations in COMSOL Multiphysics to analyze the biosensing capabilities of both model configurations. Such analyses included measuring the temperature distribution at the interface of the device as well as the electrical potential (shown in the following set of figures). The findings revealed that the graphene-based structure possessed a sensing ability regardless of the specific design. Temperature distribution plots at the interface for the device with two electrodes (left) and the device with four electrodes (right). Image by E. Lacatus, G.C. Alecu, and A. Tudor and taken from their paper “Models for Simulation Based Selection of 3D Multilayered Graphene Biosensors“. Electric potential plots on the interface for the device with two electrodes (left) and the device with four electrodes (right). Image by E. Lacatus, G.C. Alecu, and A. Tudor and taken from their paper “Models for Simulation Based Selection of 3D Multilayered Graphene Biosensors“. After identifying these sensing capabilities, the team tested a number of different biosensor device structures as a means of determining the optimal response for the PVA hydrogel on the sheets of graphene and for the protein-functionalized graphene biosensors. Simulation proved to be a useful tool for analyzing such properties. 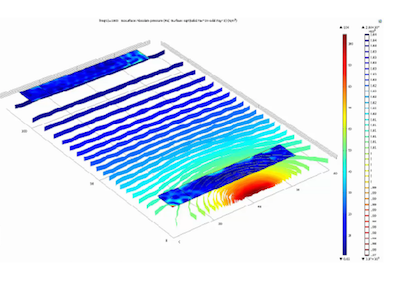 The simulation results shown below, for instance, highlight the spatial distribution of flux energy on the graphene biosensor as well as the interface charge distributions for the device with four electrodes. 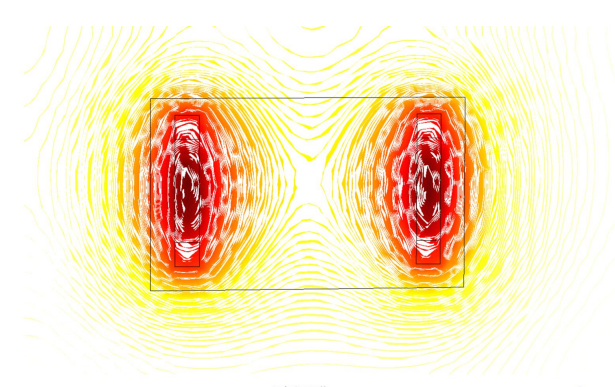 Simulations corresponding to the spatial distribution of flux energy on the graphene biosensor (left) and the interface charge distributions (right) for the device with four electrodes. Image by E. Lacatus, G.C. Alecu, and A. Tudor and taken from their paper “Models for Simulation Based Selection of 3D Multilayered Graphene Biosensors“. 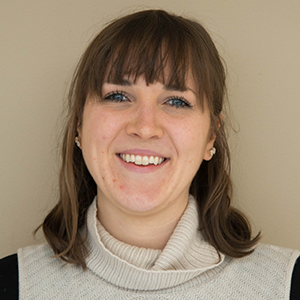 Furthering the researchers’ studies were analyses designed to show how different environmental stimuli influence the biosensor when reaching its active surface. Using the Acoustics Module, for example, the researchers were able to define the response of the interface to variations in acoustic pressure. The results below illustrate the effects of the acoustic stimuli on the graphene sensing structure for the device with four electrodes. Analyzing the impact of acoustic stimuli on the device with four electrodes. Image by E. Lacatus, G.C. Alecu, and A. Tudor and taken from their presentation “Models for Simulation Based Selection of 3D Multilayered Graphene Biosensors“. With COMSOL Multiphysics, the researchers could successfully identify the relevant properties of the graphene biosensing structures, all while relating them to the complex interface of the human skin. This simulation research, combined with the models themselves, provided valuable design solutions in the development of graphene-based biosensors. I am working on Graphene. I am interested to know the material properties of Graphene-like piezoresistive coupling matrix and Electroresistive matrix and Loss factor for elasticity D, Voigt notation. Anticipating for a positive response and your valuable guidance.